着物.fraise.net » Blog Archive » Akemashite omedetou! 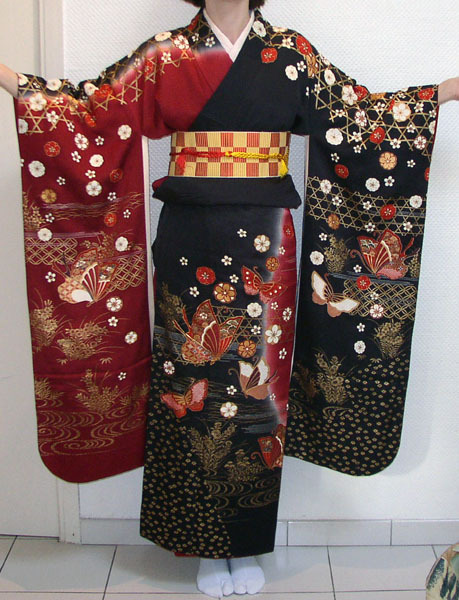 From left to right: The first photo is with a datejime, before putting on the obi; the second and third photos are fully dressed. I’ve posted the first photo because of what becomes apparent in the second: my furisode is too short to be worn with an ohashori. You can see that the hem is well above the floor, when furisode should just touch the floor. 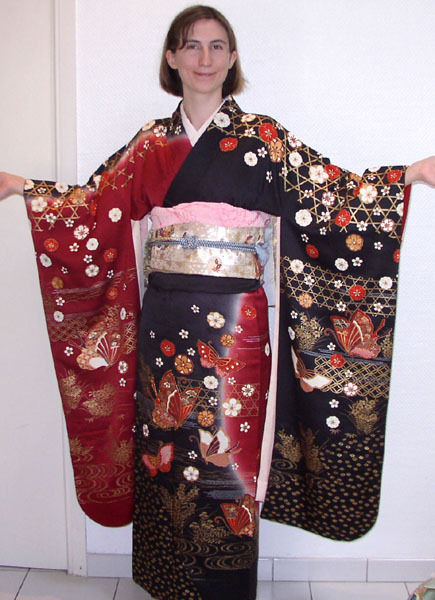 (That way when you wear zori, your heels are completely covered by the kimono.) 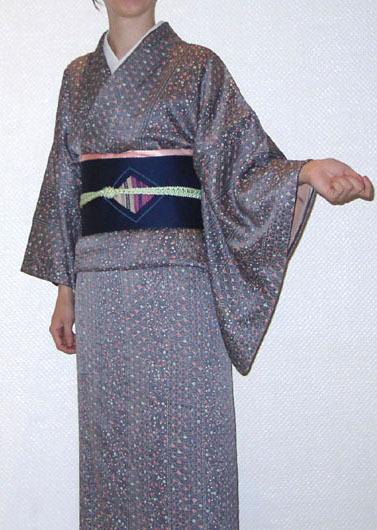 The third photo shows that the kimono has started to sag at the waist, which is due to the too-short ohashori. It only just covers the koshihimo beneath! Because of this, next time I’ll try wearing it without an ohashori, much like wedding kimono are worn. The obiage also needs some work, but aside from those concerns, I’m very happy with the ensemble. I also tried on my favorite komon with a fukuro Nagoya obi. This kimono is just the right length, and it makes all the difference! The obiage looks very good (hurray! ), as does the obijime, the collars are well done, the ohashori is just right, and my Nagoya obi musubi looks nice, although it has a slight tilt to it. As for the downsides, my han eri inched up in the back (it should be covered at the nape) and the front panel is too far to the side. This entry was posted on Wednesday, January 7th, 2004 at 10:26:16	and is filed under Kitsuke. You can follow any responses to this entry through the RSS 2.0 feed. You can leave a response, or trackback from your own site.